Kia says the new Rio's character line rising out of the front wheel gives it a sense of movement and fluidity, even when stationary. Kia says it has given its new Rio subcompact a 'powerful, bold design' that marks the next big step in the company's new styling direction. 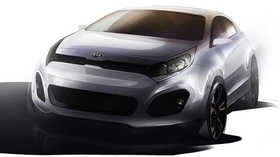 The new Rio will be unveiled at the Geneva auto show in March alongside the new Kia Picanto city car. The Rio will compete in Europe against cars such as the Ford Fiesta, Opel/Vauxhall Corsa and VW Polo. 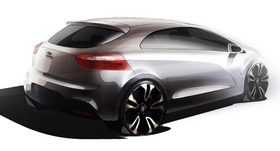 Kia released sketches of the new Rio on Wednesday. The company said the latest generation is longer, lower and wider than the existing model and is designed to inject emotional appeal into its segment. The car will target "progressive, energetic consumers who want a stand-out design," Kia said in a statement. Inside, the Rio will offer a feeling of quality typically associated with larger, more expensive models. Kia Chief Design Officer Peter Schreyer said the Rio's sporty and elegant design will help the company win customers who are downsizing to smaller cars. The Rio has a sleek, almost coupe-like profile. The current Rio was Kia's third best-selling vehicle in overseas markets during 2010 with sales of more than 205,000 units.